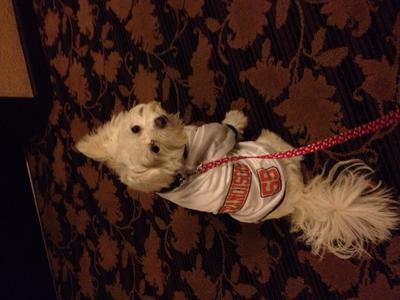 Jasper the loyal San Francisco Giants 2014 World Series championship pup! Jasper says "oh no, Here we go again!!! " He does not want to be left behind. Yes, Jasper has to wear his baseball jersey one more week!! Yea! San Francisco Giants 2014 World Series Champs!! Comments for San Francisco Giants win!!!! Contrats to Jasper and the Giants! I have to admit I didn't watch one second of the series! Ha!